After your content has been translated, it will be proofread and reviewed by another second-round of linguists. Their meticulous attention to detail will guarantee that your messaging is pitch and note-perfect without a mistake in sight. 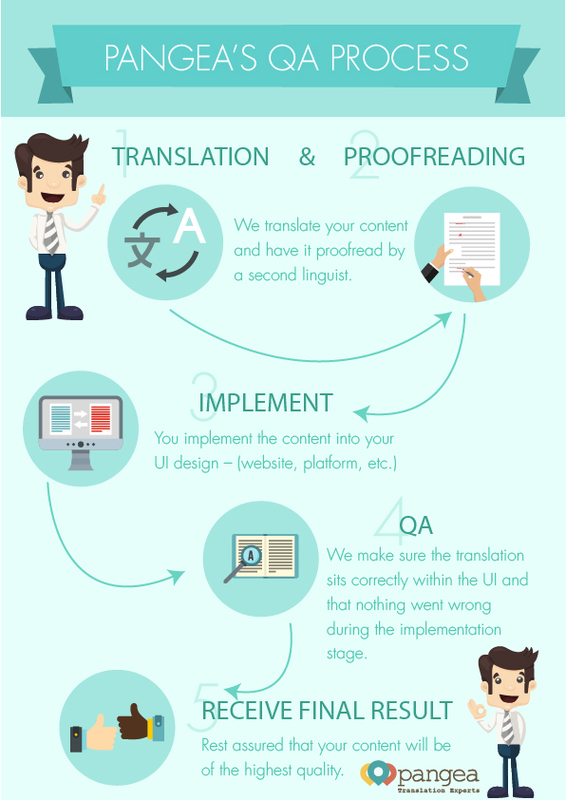 Once your translation is complete and incorporated into a design, you can send us the result for QA and testing. When we receive your files or URL, we ensure that the graphics, icons, fonts,scripts and the overall layout of the UI is correct and up to standards according to your guidelines. with a report outlining any changes required. To be able to fully QA a platform or website, on its diverse scenarios, you need to follow through different sequences. Our QA testers will follow your User Story and test cases to a T to make sure that all elements in your UI are precise and free of errors. We’ll check elements like button texts, warning and error messages, banner wording and other linguistic factors that might tamper with your design. After the QA, our designers are more than happy to make any necessary adjustments for you. You don’t have to worry about fixing the layout of your design. We’ve got the skilled personal to make sure clients receive a high-quality, end-product that’s error-free and exceeds expectations. products that are below standards. Secondly, you waste time and ultimately, money.